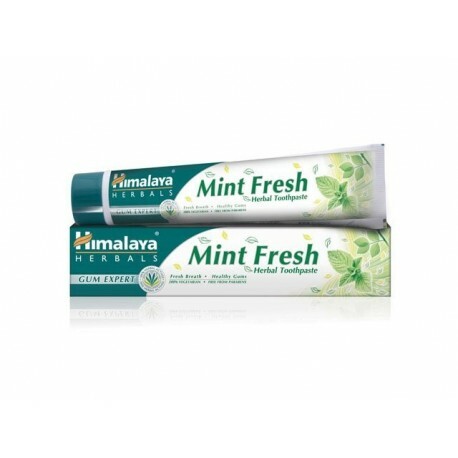 Enriched with mint and dill Indian gel refreshes and reduces odors in the mouth, providing a long-lasting fresh breath. Healthy gums helps to maintain healthy teeth and good oral hygiene. Himalaya Herbals series for gums contains misvak (oriental tree used for cleaning teeth), which has natural astringent effect and keeps gums healthy and protected. Parabens Free. 100% vegetarian. Does not contains fluoride. Enriched with mint and Indian dill this gel refreshes and reduces odors in the mouth, providing a long-lasting fresh breath. The gel reduces plaque and provides 12-hour protection from harmful germs. Misvak - relieves inflammation of the gums and reduces bleeding. Indian dill - Helps to reduce the smell of the mouth. Fennel and cloves - extracts of fennel and cloves have natural astringent effect. Strengthen gums. Use it two-three times a day. Appropriate for children up to 6 years. Use a pea-sized quantity and brush your teeth under adult supervision to prevent swallowing of the product.